Just last weekend, the handsome hubby and I took a little road trip to Savannah to attend a wedding. Besides the fact that we love the couple that was getting married, it was a great chance for the two of us to get away (to somewhere other than St. Louis) and spend a little bit of time together. It was, in a word, heavenly. Although, if I was forced to define the weekend by just one word, humid, might be most appropriate. But, let's focus on the positive instead. Savannah is really a lovely city chock full of history and architecture and amazingly yummy food. We took advantage of all three during our stay and even managed to do a little bit of dancing (little being the operative word in the hubster's case). On Saturday morning, we decided to take a trolley tour and get to know the city a little bit. I'll admit that I'm kind of nerd when it comes to learning about the history of a city I'm visiting. I looooooove to take any kind of tour I can. The one we took did not disappoint. In fact, I consider myself a bit of an amateur Savannah historian now. This brings us to today's post, which is my version of quick history lesson. Savannah was founded in 1733 as the capitol of the thirteenth colony, Georgia. It was painstakingly planned by General James Oglethorpe. Oglethorpe had four prohibitions placed in the city's charter when it was founded. 1. There were to be no slaves (though that didn't last long thanks to South Carolina flaunting their "help" to the wealthy residents of their neighbor, Savannah). 2. There were to be no Catholics (Savannah's proximity to Florida, which was controlled by Spanish Catholics, made Oglethorpe nervous. He didn't want any Spanish sympathizers around). 3. There was to be no hard liquor (beer and wine were just fine though). 4. And no lawyers allowed (Even then lawyers were known to be contentious and divisive). Oglethorpe planned the city on a strict grid around four open squares and intended that Savannah continue to grow in the same vein. By the mid 1800s the city had grown to include twenty-four squares. Twenty one of these original squares still exist today and they make wandering around the city pure pleasure. 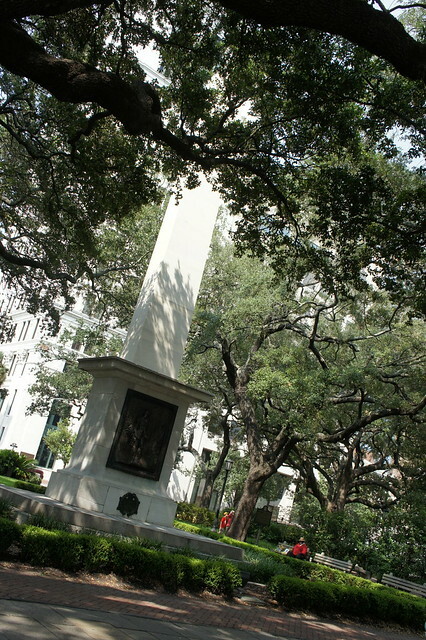 The squares (and most of the city) are filled with the state tree, the live oak. 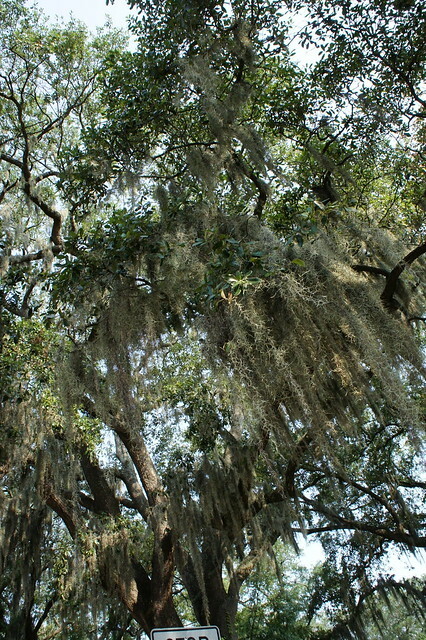 The oaks are covered in Spanish Moss. Only, it turns out "Spanish Moss" is neither Spanish nor moss. It's actually a plant related to the pineapple. Crazy, right? Savannah takes credit for creating three distinctive colors. There's a green, a red and this blue. I find it and its story to be the most interesting. 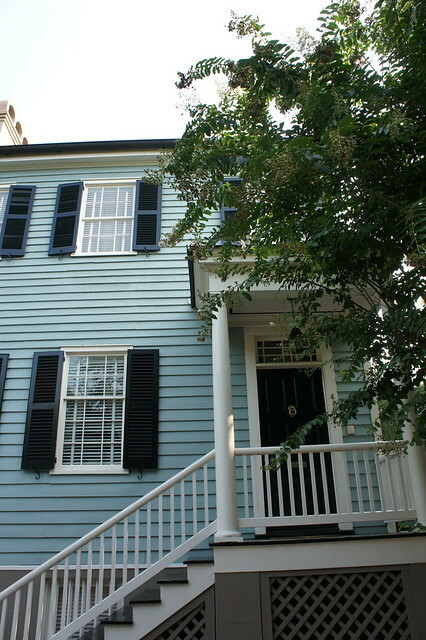 The blue on the siding above is called "haint" blue. Back in the day, Savannah was a very superstitious city. Conventional wisdom was that spooks and goblins were scared of water. In order to scare them away, this "Haint" blue was painted around doors, windows, on ceilings or if the resident was super superstitious, on the entire exterior of the house. 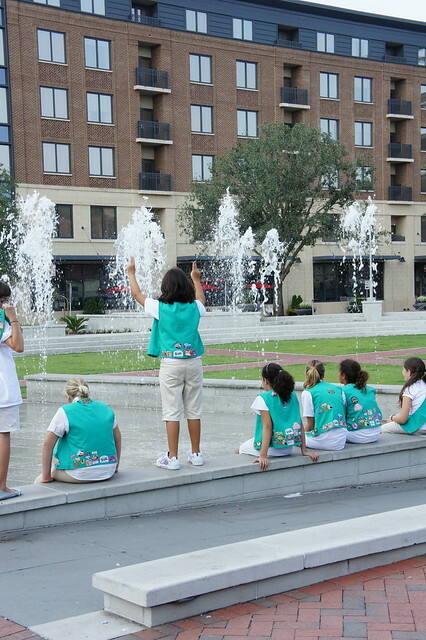 Savannah was the birthplace and home of Juliette Gordon Low, the founder of the girl scouts. Maybe it was just this weekend, but the city was crawling with scouts. It was like an infestation. All in all, the weekend was a blast. The wedding was a beautiful event and a wonderful way to conclude what has been a two year wedding extravaganza for us. As far as we can tell, this is the last wedding we'll be attending for awhile. Unless someone out there knows something we don't know... anyone? In other, non-Savannah related news, I may have set a world record. See that red dress I'm wearing? I've worn it twice as a bridesmaid and once, now, as a wedding guest. I'd say that's kind of impressive, wouldn't you? 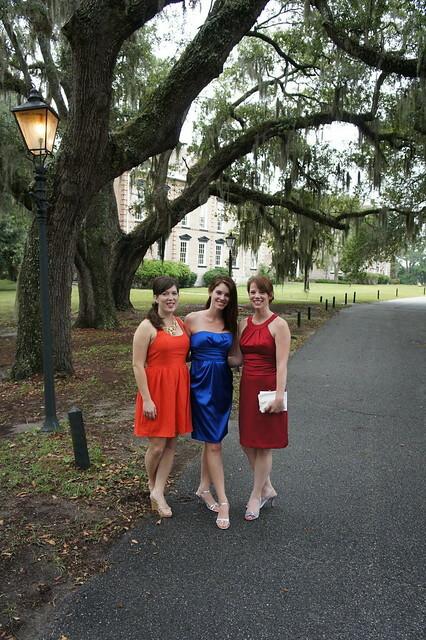 It almost breaks all the laws of bridesmaid dresses. I mean, it's not that I'm trying to brag. I guess it just comes naturally. Have you ever actually re-worn a bridesmaid dress?